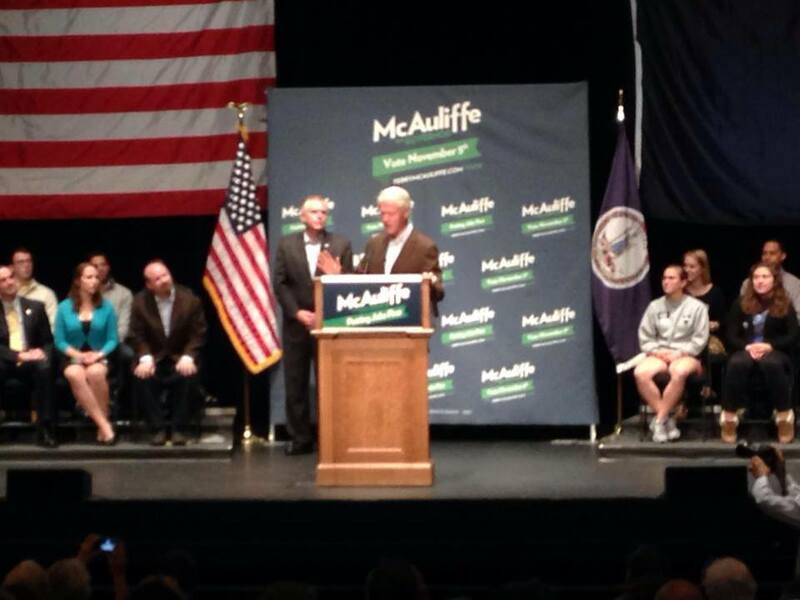 President Bill Clinton spoke in Charlottesville on Oct. 30 to campaign for Terry McAuliffe. Since college, the Clinton family has always found a way into my life. On Wednesday, President Bill Clinton found his way to the Paramount Theater in Charlottesville to campaign for his buddy, Terry McAuliffe, who’s running for governor of Virginia. I was one of a handful of reporters inside the theater for the event. Clinton is an engaging speaker. He’s very understated, he has a dry sense of humor, and he’s got some sort of deadpan delivery. It’s just fun to watch. Covering Clinton this week made me think back to 2008. It was a time when then Sens. Barack Obama and Hillary Clinton were fighting for the Democratic nomination for president. The Pennsylvania Primary was the first call for voters in six weeks, and the race was contentious. Chelsea Clinton went to Philadelphia a handful of times. At one event, she spoke at a small restaurant in Fairmount. As she schmoozed with the crowd afterward, I stood on top of a chair with my camera to try getting some different shots. That’s when I met Felipe, the Secret Service agent who lifted me up and brought be down. I covered primary night for The Temple News, and I was at the Clinton victory party at the Bellevue. I was a junior in college, playing ball with CNN, Fox News and some reporter from Australia who was standing next to me. As the night progressed, I was feeling pretty awesome. Then, Clinton won the primary. The energy from the crowd was incredible. A couple hundred people filled the ballroom, and they were all waiting for the winner to take the stage. And when she did, it was pretty epic. I guess I should preface all this by saying I’m a political nerd. I find the electoral process fascinating. I love covering rallies and campaigns. I love hearing politicians speak. So when Hillary Clinton stepped on stage at the Bellevue not long after being declared the winner with daughter Chelsea and husband Bill, I realized I was witnessing something pretty special. Especially considering I was low journo on the totem pole, in regards to media organizations. Clinton gave her remarks. She amped up the crowd. The family of three waved from the stage. And like a whirlwind, it was over. As in awe as I was then seeing such a political powerhouse family in front of me, it doesn’t change my excitement or anxiousness when I see a former president now. So now, after my most recent encounter with the Clinton family, I can’t help wonder what I’m going to cover next.